Growing Expectations is well aware of the reaction people in offices have to indoor plants. When we freshly install plants the staff’s reaction is nearly always positive and welcoming, and most people would like to have a plant near their desk. The plants appear to improve staff morale. On the other hand, taking away the plants is not popular, and we have been asked at times by management to remove the plants when the staff is not there, to try and limit the impact of their removal on morale. I suppose it does make sense that people have an affinity with greenery. It is part of nature, and we have lived close to plants for millions of years, it is only recently that we have started to lock ourselves into concrete boxes well away from nature. I suppose, as the saying goes, indoor plants bring the outside in. The other thing we have observed is that people love well cared for and healthy plants, but it depresses them when a plant is not looking its best. We sometimes get calls from concerned clients, worrying about a plant that might have a yellow leaf (and is otherwise quite healthy), but they are worried that it might be dying, and they are concerned. Healthy and well cared for plants improve morale, but sick plants do not. In fact they could depress morale. 1. The majority of both men and women in the study thought of indoor plants as giving an impression of warmth in the work environment. 2. 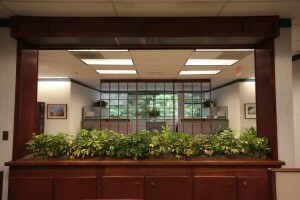 The effective use of indoor plants may give the impression of a well run organization. The title of their paper was, very appropriately, “The Use of Plants to Promote Warmth and Caring in a Business Environment”. Which business would not want to have a well-run and caring work place? Well it seems that having well cared for indoor plants helps to achieve that, and the best way to do that is to have a professional interior plantscape service. 1. People’s perception of an indoor space is more positive in the presence of indoor plants. 2. The indoor space was perceived as more relaxed and less stressful with indoor plants. 3. Both men and women displayed a preference to sit close to plants. The Green Building Council has awarded points for LEED certification in two projects, one in Canada and another in the United States. Green Plants for Green Building is working aggressively for the use of indoor plants to be awarded credit for all LEED certification. 1. The environment in offices with plants felt fresher, made them feel less stressed, made the working feel more human and in general seem to up-grade their environment. 2. Plants in offices improved employee’s perception of their well-being as well as improving the comfort-factor of the offices. 3. With improved conditions and perceptions, office employee’s will enjoy their work situation better; happy employees = more output and happy bosses.